Jan-Krzysztof Duda beat his Polish compatriot Radek Wojtaszek for the second game in a row to remain the sole leader in Dortmund on 2.5/3 and enter the world’s Top 20. A dramatic day also saw Liviu-Dieter Nisipeanu swept aside by Ian Nepomniachtchi, who ended the game with 2 hours and 11 minutes remaining on his clock, while world no. 6 Anish Giri fell to defeat against world no. 97 Vladislav Kovalev. 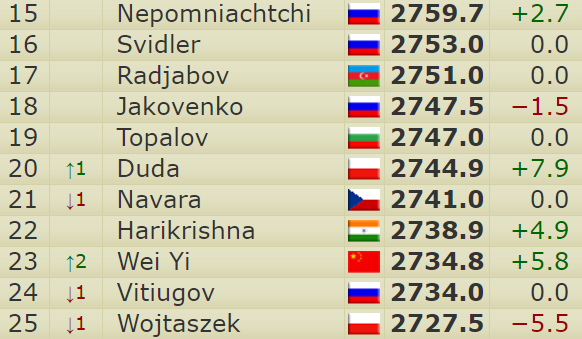 Only Vladimir Kramnik and Georg Meier have drawn all their games so far. After drawing the first two games with Black it was clear that playing White in Round 3, against a player he outrated by almost 130 points, was the moment for Anish to try and kick-start his tournament. Instead, though, he found himself surprised by Vladislav Kovalev in the opening as early as move 2, with 1.e4 c5 2.Nf3 Nf6!? a relatively rare line of the Sicilian only championed at the very top level recently by Shakhriyar Mamedyarov, who played it in the recent Grand Chess Tour events and in Tata Steel earlier this year. Giri immediately sank into a six-minute think before going for 3.e5, and continued to play slowly thereafter. In one move the world no. 6 had abandoned the e3-square, the f4-pawn and allowed Kovalev to eliminate his one weakness with 35…d4!. White can’t capture the pawn without allowing Qe3+ to follow with decisive effect, when it’s not just that the f4-pawn falls – the white king is also fatally weak. Giri instead struggled on with 36.Qd2!, but after 36…dxc3 37.bxc3 it was now White trying to defend a crippled pawn structure. 66…g4! 67.hxg4 Qxg4 68.Qg6 Qxd4+ and Black had won a pawn with the white king also in huge danger. Anish could only prolong the struggle another five moves before conceding defeat. The tripled f-pawns are just the most visible sign of how much had gone wrong for the defending champion. Black is in complete zugzwang. The remaining game saw Vladimir Kramnik trying hard to improve on his 6 wins to 1 record against Georg Meier. 23.g4!? was perhaps a somewhat artificial way to try and make something happen, though, with the kingside “pawn storm” also weakening White’s own king position. There were tense moments, but ultimately Kramnik was frustrated again. The big clash of Wednesday’s Round 4 is also the biggest test yet for Duda, as he takes on Kramnik with the black pieces. It’s a key game for both players, since given the tournament situation Vladimir really needs to play for a win – not that he ever does anything less with White! In the other games Meier-Kovalev, Nisipeanu-Giri and Wojtaszek-Nepomniachtchi the higher-rated players have Black, which on paper makes draws a likely outcome. Follow all the action live here on chess24 from around 15:15 CEST on Wednesday! Dortmund 2018, 1: "Chess is ugly and a draw"